Larchmont is a half-square-mile neighborhood in the central region of the City of Los Angeles, California. Larchmont is notable for its quaint old-town shopping street and well-maintained historic homes. It has four schools and one small park. Chevalier's Books, the oldest independent bookstore in Los Angeles, resides on its main boulevard. It has been the site of early and recent motion picture shoots. Described by the Mapping L.A. project of the Los Angeles Times, Larchmont is flanked by Hollywood to the north, East Hollywood to the east, Koreatown to the southeast, Windsor Square to the south and Hancock Park to the west. Street boundaries are Melrose Avenue on the north, Western Avenue on the east, Beverly Boulevard on the south and North Arden Boulevard on the west. The 2000 U.S. census counted 8,631 residents in the 0.49-square-mile neighborhood—an average of 17,747 people per square mile, one of the highest densities in the county. In 2008, the city estimated that the population had increased to 9,195. The median age for residents was 34, about average for Los Angeles; the percentages of residents aged 19 to 49 and above were among the county's highest. Larchmont was highly diverse ethnically, and the percentage of Asians was comparatively high. The breakdown was Latinos, 37.2%; Asians, 30%; whites, 24.6%; blacks, 3%, and others, 5.3%. Korea (28.3%) and Guatemala (16.8%) were the most common places of birth for the 56% of the residents who were born abroad, a high figure compared to rest of the city. The median yearly household income in 2008 dollars was $47,780, average for Los Angeles, but a high percentage of households had an income of $20,000 or less. The average household size of 2.5 people was average for the city of Los Angeles. Renters occupied 72.9% of the housing stock, and house- or apartment owners 27.1%. The percentages of never-married men and women, 42.1% and 36.9%, respectively, were among the county's highest. About thirty-two percent of Larchmont residents aged 25 and older had earned a bachelor’s degree, with over 60% percent having a high school education level, an average figure for the city. Robert Burns Park, 4900 Beverly Boulevard, unstaffed pocket park with a play area and picnic tables. ^ Button, Liz. "Chevalier's Serves L.A. Neighborhood for 76 Years". bookweb.com. American Booksellers Association. Retrieved 23 October 2018. 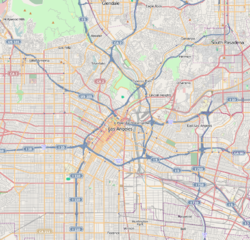 ^ "Central L.A. - Mapping L.A. - Los Angeles Times". Projects.latimes.com. Retrieved 2015-02-24. ^ a b c d e f "Larchmont Profile - Mapping L.A. - Los Angeles Times". Projects.latimes.com. Retrieved 2015-02-24. ^ "Memorial Plaque Honors Larchmont Village Founder Julius LaBonte". 7 December 2012. ^ BETSKY, AARON (29 July 1993). "Larchmont Boulevard: L.A.'s Version of Main Street, U.S.A." – via LA Times. ^ "City of Los Angeles Department of Recreation and Parks". Laparks.org. Retrieved 2015-02-24.